collection ranges in retail prices from $130 to $230 USD. 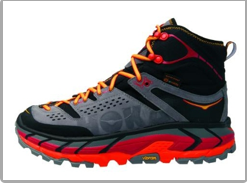 The flagship of the MTN Trek series is the Tor Ultra Hi WP. Weighing slightly over one pound, the Tor Ultra Hi WP combines HOKA's signature running shoe cushioning and Meta-Rocker geometry with a supportive high-top upper. The new silhouette is rich with performance enhancing features, including a new Vibram® MegaGrip outsole rubber with five millimeter lugs to provide traction over varied terrain, a leather and nylon mesh upper for durable support, and an eVent® waterproof, breathable membrane to keep feet dry. 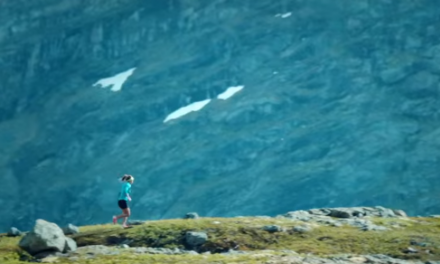 The new Speedgoat, designed with input from legendary ultra-runner Karl Meltzer, is HOKA's newest trail running shoe, retailing for $130 USD. The Speedgoat is built for the most challenging, technical trails, featuring a Vibram® rubber outsole with four-millimeter lugs and trail-specific flex grooves. The no-sew upper provides support through the forefoot, and a ground-rubber toecap offers critical toe protection. This new silhouette provides lightweight traction and stability all within a package that weighs less than 10 ounces. Also included within the MTN Run category, the Mafate 4 is available for $170 USD and is the brand's most cushioned and supportive trail running shoe to-date. Late-stage Meta-Rocker geometry, plus deep longitudinal and lateral flex grooves in the outsole, provide unbeatable stability over uneven terrain. A TPU toecap adds protection and wide toe box keeps feet happy.